For many of us educators, learning about the early childhood centers in Reggio Emilia, Italy was immediately inspiring. What they were doing with children made sense and fit with our ideals about how we wanted to teach and learn. We wanted to dive in, adapt and embed their practices into our own classrooms right away. Each of us then had to choose a place to begin incorporating Reggio-inspired practices into our own work. It is often hard to know where to start, since even an initial study of those beautiful Italian classrooms and the deeply considered philosophy that undergirds them reveals how incredibly complex it is. Some people begin by redesigning their environments. They evaluate and make changes to their physical spaces, room layout, the materials available to children and even the colors and containers in the room. Other people begin by introducing project work, building children’s interests into some deeper, bigger study of a topic, stimulating children’s thinking in a way that recognizes their strong capabilities. But one of the most basic and essential places we can begin to emulate the effective practices we see in Reggio Emilia is with documentation. Documentation is a term that is becoming common and almost jargon-y in early childhood education. When that happens, the word can begin to lose its true meaning, becoming over-simplified or interpreted in a shallow way. There are even companies promoting products and systems to help teachers “document,” often for the purpose of accountability, gathering data to prove that the children are meeting some set of predetermined standards. But in Reggio Emilia, documentation has a much deeper meaning. At its heart, pedagogical documentation in the Reggio-inspired sense is the practice of paying close attention to what children say and do. It is a stance, a way of seeing with intention and curiosity. The practice of documenting is based on the belief that young children are innately driven to learn, that their actions and words are powerful and purposeful, and that they are actively engaged in making meaning all the time from their daily lives. Documentation does not mean simply taking lots of photographs, writing down quotes from children or posting panels on the walls – although those activities are often part of the documentation process. The artifacts alone are not the essence of the concept. Authentic documentation in the Reggio sense involves making intentional choices about what data to collect, reflecting on the data, interpreting and analyzing it with colleagues, communicating what you’ve observed with families and with the children themselves, listening to their interpretations and using what you’ve learned to plan for new experiences. It’s a very complex cycle! Many of us in the Network have felt the need for more reflection and collaboration with colleagues about our documentation efforts. When we closely observe a group of toddlers playing together at the water table, or a five-year-old making an original “invention” out of recycled scrap materials, we are naturally excited. We want to share our questions and our observations of what our children are doing with others who can help us understand more deeply what is really happening. Having other sets of eyes and ears to look at our assorted photos, notes and snippets of collected dialogue often brings new perspectives to our work – even when those colleagues might not know our children or be part of our program. To meet this need, the Network is creating a new initiative: the Documentation Lab. 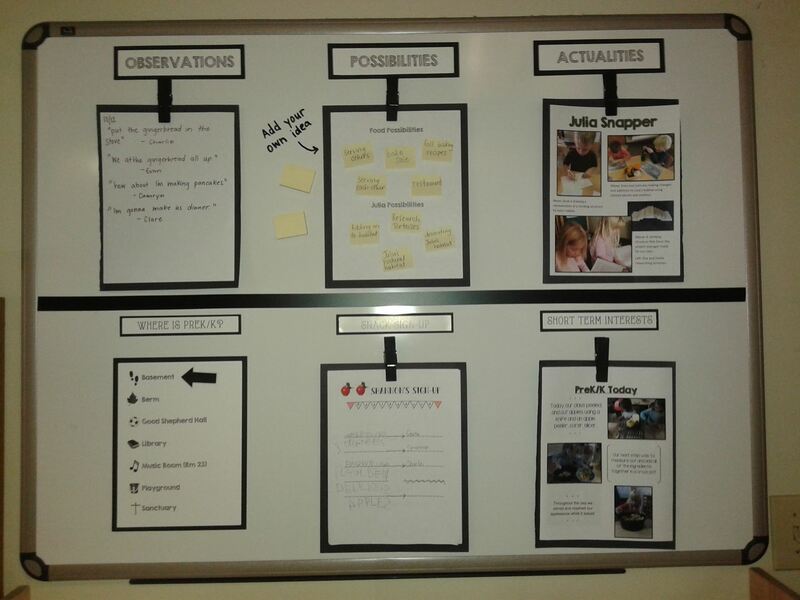 We want to offer educators an on-going way to share traces of their work with each other, get and give feedback about documentation and generate ideas for next steps in learning based on what children have been doing. We envision the Documentation Lab as a co-facilitated, collaborative working group where participants can bring work-in-progress, critically analyze it and learn from each other, at whatever stages we are in our practice. A core group of interested Network members started tossing around ideas for the Documentation Lab this summer. But we also invite input from potential participants to help decide when, where and how often we’ll meet – probably one evening a month or every other month, meeting at a public site such as a library – and what our format should be. The Lab gatherings will be free and open to anyone who wants to learn more, whether you are experienced in using documentation or whether you are brand new to the idea. The official “kick-off” of the Documentation Lab initiative will be on September 23, as part of the regular monthly Network gathering. Join us for a workshop focused on documentation: “Set Your Intention to Pay Attention,” 9:30 a.m. to noon in the Lakeview Room in the Hyland Lake Park Reserve in Bloomington, Minnesota. Then add your voice to give direction to this new opportunity. More information about the Documentation Lab will be widely shared within the Network as it takes shape. Victoria Snyder is a teacher of 2 year olds at Westwood Lutheran Early Childhood Center in St. Louis Park, MN. Westwood teachers collaborated with Boulder Journey School (Boulder, Colorado) consultants Alison Maher and Andrea Sisbarro in July, 2016. I experienced a real game-changing moment while collaborating with consultants from the Boulder Journey School. From the moment my teaching team sat down with Alison Maher and Andrea Sisbarro, I knew that my practice would be forever changed. They invited me to think about my written observations of my students. What they shared was not new information to me, however, it was about the way in which they delivered the advice, so specific and relevant to my work, that helped me understand on a deeper level. The conversation was not only inspiring, it prompted me to put into motion some plans that I had been thinking about for a long time. For example, my toddlers are currently very interested in Matchbox cars. Now, when I write an observation about their interactions with the cars, I write exactly what they are doing with the cars. I ask myself, are they making noises as they roll the cars? Are they lining them up in a row? Who is involved in this scheme? My next action is to consider an abundance of ideas and ways for the children to use the cars in different ways. Alison and Andrea challenged us to generate a list of 50 different things children could do with the cars. In addition they challenged us to think about why the children are so attracted to these cars. Is it because they are new? Could it be the variety in shape and color or is it because there are a lot of them? These observations help me be more intentional and deepen the children’s experiences. I was inspired and motivated by the conversation and have begun to rethink my classroom environment, especially the materials. Alison and Andrea commented that they see the same materials in classrooms worldwide. They also challenged us to think about “everyday” materials paired with unique items. What can we as educators offer children that they don’t already have? This insight helped me open my mind and classroom for more “outside the box” ideas and materials that might afford children new and diverse experiences, for instance, pairing the beloved Matchbox cars with different colored and textured ribbon. Generating ideas this way helped me to explore multiple possibilities for deepening children’s interests. This rich dialogue amongst educators opened up many questions for me. For example, how can we create more opportunities for inspiring dialogue such as this? How would professional development change if administrators offered opportunities to educators that meet them wherever they are along their journey? How can we put all the amazing things that we learn into motion? And, how can we always remain open to others’ advice? The wish for myself and for fellow educators is to find a way to manifest these interactions that are so powerful that they help create the highest quality of care, for which we as Reggio-inspired educators strive. Here is a translation of the video linked below, from an unnamed participant on another reggiolist. PRESENTER: "Stimulating children's curiosity and searching together for new experiences, this is the philosophy of the early childhood centers of Reggio Emilia, which have and are really fascinating the whole world. VOICEOVER: "We follow this painted branch (on the pavement) which leads us to the Robinson (Crusoe) Preschool in Reggio Emilia, named after the protagonist of the novel, because on his island he invented/discovered many things and most of all was courageous/brave. Every school in RE is an ideal city with a piazza (central town square) and spaces that are circular/in the round and Ateliers where everyone can work, see each other and work together, and if they wish even on their own - even without shoes as the floors are heated." REPORTER: "In the preschools there are always many big windows, and here we can see a tree, a big tree, and these are its roots (he points to the graphic representation on vellum that hangs in the window.) Here we can see (he points to artefacts on the table) various interpretations of roots and those over there are the layers of the soil. In the room next door, we find the "Rooty Room," and here the children are listening to the sounds that roots listen to, from the those of the children's steps to those of the ants (moving above them.) And these are the sounds that the children believe roots hear and that they created with a wide range of objects (brush being scraped on a surface.) Among the many activities (time code 15:03) that the children engage in is the creation of video, this one is dedicated to the "Dancing Grasses." The Reggio Children approach to education, last year, sent over 5000 delegates to Reggio from all over the world. However the Reggiani's approach is not intended as a model." PAOLA CAGLIARI (Director of Reggio Children's schools): (time code 15:27) "Adults here, teachers in particular, are researchers of experiences alongside the children. They are side-by-side with the children so that the children may be able to give shape to the best of their ideas and are, therefore, in circular relationship in which the adult-child and child-child dialogue constructs/gives shape to knowledge." REPORTER: (time code 15:50) Kitchens are inside each of the schools, and products used in them are from a short distance away, organic and chosen giving particular attention to the raw ingredients that go into them. Robinson preschool has flexible hours, with arrival between 7:30 AM and 9 AM and dismissals at 12:30 PM, 4 PM and for those who require it even 6:30 PM. Parents are pleased on many levels. FRANCESCA ROVANI (current parent): (time code 16:10) "This is the school that I attended as well, so I made a choice with my heart as well. We could have made a choice to go to a school closer to home, but this was a special choice." REPORTER: "In your experience, what are children left with after they leave these schools?" PARENT: "Curiosity and the passion of exploring/understanding and facing the world and knowing things." REPORTER: (time code 16:31) "In Reggio Emilia, 41% of children attend one of the city's infant-toddler centers, while 90% are enrolled in the preschools. We are talking about one of the highest enrolment levels in this age group in the whole of Europe. This is one that requires a fiscal commitment on the part of the municipality of Reggio of over 21 million Euros a year." LUCA VECCHI (Mayor of Reggio Emilia): "It is a model that has involved the entire community ever since it's inception. A model that has involved the central role of parents and educators. That is the remarkable aspect of this city, to feel a strong sense of belonging that is built around a set of values and principles in which education, and in particular the education of children, has always been one of our noteworthy capacities." Sandy Burwell is offering a children's literature and creative expression class on Saturday, January 14. This class is not hosted by the Reggio-Inspired Network of Minnesota. To Register - Email Sandy at smburwell@gmail.com. Go to the Facebook page titled Learning Together for more information. Jen Johnson is the Director of Willow & Sprout in Saint Anthony Minnesota. Last spring they hosted a Saturday Gathering at their center. During that Gathering, Jen talked about the importance of self-care which resonated with those attending. We followed up with her about the importance of self-care in a teaching practice that requires observation and reflection. We separated the conversation into three posts. This is the first of three. How do you define self-care for yourself and your teachers? For me, it is about being mindful and intentional to nurture and love one’s whole self - your mind, your body and your spirit. We, the staff, sit down and create personal goals for each of those areas and it is the same thing that we do with the children. We have leading questions – how do you love yourself? How do you notice yourself – your whole self, your mind, spirit and physical body? And then, how do you nurture yourself? How do you love yourself? We separate those because nurturing can be different than loving. I tried to make it as simple as possible. This could be a new topic for some of us and I didn’t want to make it too complicated. One of the things I think about is how do you rest? How do you replenish? How do you find those quiet spaces in your day so you can replenish and get a break from daily rhythms? How do the goals work? Weekly? Yearly? We have yearly goals and then every month I do a check-in and then if they need something different in between we can talk about it and change it. Up until now the check-ins have been via email because that was what we all wanted. This year we are going to go deeper into the work with a physical check in vs email only. We need to figure out if email needs to be bi-weekly. With email it is easy to let the work go; with a physical check in there is a different level of accountability. It is vulnerable work. Why is it important for a practice that requires teachers to be present and reflective, to have self-care as a priority? When I looked at the profession I really saw high turnover. At my first teaching job there was turnover after turnover after turnover. We know from research and best practice that young children need consistency. There are many factors that go into consistency, but one of the things I noticed across the profession was that the teachers are really not looked at as professionals. They need to be treated with respect as professionals and as a whole person... with hobbies, interests and families outside of work as well. We have a huge disparity in how the teachers are valued and seen, not only in their organization, but as a culture. We have some work to do, we need to consider all of the parts that create a caring environment in our early childhood communities. It has to be about holistic living. It has to be about connection. It has to be about the four parts - children, environment, parents and teachers. We need to consider all of those entities. Also, in order to be present and reflective you have to be able to do that for yourself. If you don’t take that time, there is often a huge disparity between what you say you want and desire and what you can actually do. I do like the airplane analogy. Put on your oxygen mask first; then you are stable and you can go and nurture others. Then that becomes the ripple effect and they become as regulated as they can be. In the next blog post, Jen will give examples of strategies for self-care the teaching team at Willow & Sprout sees as essential. In another blog post we talked to Kelsey. She is a new teacher grappling with how to balance the desire to plan and live in the now and follow the lead of the children. For another interesting perspective on planning, read this piece from veteran preschool teacher, Tom Hobson from Seattle, Washington, on why rigid planning isn't necessarily in the best interest of the children or the teacher. Blog: Teacher Tom - Teaching and Learning from Preschoolers. The following is a "teaser" of a film by Professor Dr. Sabine Lingenauber. The film explores the role of women in the development of Reggio pedagogy as a pedagogical approach. “I am a perfectionist, but I don’t want to be one,” says Kelsey Lepa, a recent graduate whose first teaching position is at Willow & Sprout in St. Anthony, Minnesota. “I like to plan and I like to know outcomes. I was taught in school that that is what you are supposed to do when you are educating children. That is what teachers do. We write lesson plans. We know where our lessons are going. We know what the children will get out of it by the end of the lesson.” Willow & Sprout is different; their work with children centers on project-based learning opportunities. They believe in the inherent curiosity of children and they give the children the space and time to follow their own curiosity. Kelsey knew she didn’t want to teach within a traditional American educational environment. From the moment of her interview she knew she wanted to be at Willow & Sprout, but being there meant being very uncomfortable as a teacher who was taught to plan. “It was overwhelming, very overwhelming, especially as a new teacher in my first job. You want to do well and doing well to me was writing perfect lesson plans and knowing exactly what was going to happen.” The time spent reflecting on her work and the collaboration with the other teachers helped her get past being overwhelmed. Kelsey doesn’t feel overwhelmed anymore. She does still feel vulnerable, but knows that that is an important part of teaching. She said that support from her fellow teachers, self-reflection and collaborative reflection help her use that feeling. Kelsey has learned to trust herself and the children. She has also embraced being a researcher – and research is never about perfection. “If an exploration doesn’t work, that is ok, maybe try it again on another day or explore it in a different way if the children are interested.” Now, she feels lucky. “This way of teaching has taught me to be knowledgeable and curious about the whole child. I am so grateful that I get to know each child as the unique and curious person that they are." Reggio-inspired classrooms are often resplendent with open ended materials, inspiration from the natural world and thoughtfully offered provocations. These are some of the reasons they are so well loved, and yet these environments can at times feel daunting when considering one's own context. By contrast, mud is a plentiful, free and rich natural material available to almost anyone. In the case of mud, we have the soil under our feet and the rain above our heads and suddenly a sensory rich experience awaits the children who dare to get messy. The beauty is around us, on a walk outside with the children when the snow melts or after a good rain. What happens next is up to the children and the teachers as they experience this abundant and rewarding material. Read these two pieces from the Nature Action Children's Collaborative about two groups of children in different parts of the world (Nepal and Australia), with very different contexts, playing and expressing themselves with the language of mud. The children in Nepal live in an orphanage, and face physical challenges. They did not have extra clothes and were given new "game clothes" to wear for their mud play. One can understand why they may have hesitated before they plunged into the muck! Still, they dared and were delighted. The children at Bold Park in Australia heard about their playing with mud, but also about how the children in Nepal had no extra clothes for this kind of messy fun. This became the inspiration for Bold Park's own Mud Day celebration, both as a way for the children to raise money to help the children from Nepal and as a way for the Bold Park children to experience the joy and wonder of mud themselves. And though these two groups of children come from different backgrounds, one group from an orphanage, the other group privileged and raising money to help the they had the same kinds of reactions to the mud; nervous trepidation, followed by cautious exploration and then fully immersive and messy play! As disconnected as we often feel with some having so much, and many more having so very little, there is beauty, too, in the idea of children all over the world playing in the mud on the same day, all connected to the earth together. With many of the children at first hesitating when they go near the mud, it also reminds us of how cultivating each and every child's relationship with the natural world is important as our lives take us farther away from nature. What kinds of play would the children at our schools in Minnesota envision if we invited them to a Mud Day? What have the children in our environments done with dirt and mud? And what could we do to help them envision and create a fantastically messy mud playground of their own? In this documentation from Westwood Early Learning Center one sees observations, possibilities, and actualities. In the observations, the reader sees the children’s ideas as they work together. The possibilities are listed simply; a cluster of post-it notes of some possible outcomes with an invitation to add one’s own idea. The actualities show the reader what actually happened with the project. The layout of this documentation makes manifest the middle step, the step of possibility. The consideration of possibilities creates a pause. This pause creates space to consider what the teacher saw, and to reflect on what he or she might offer next. Too often, the current discourse in American education says one must know the ending before one begins and the only question is, “How well did you get there?” This documentation from Westwood shows another possibility in the classroom; teachers and students begin a project without a preordained ending, then question, reflect, and look for the answers together.